The powder blend of papaya for fine or natural hair. 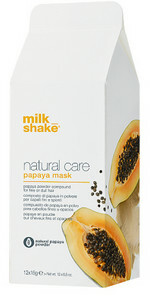 The extracts of papaya and honey for shine and hydration. The combination of milk protein, sunflower extracts of avocado oil, rice and apple for delicate treatment. Ideal for fine or dull hair. Mix 15 g powder mask basis and apply to damp hair. Then rinse well.